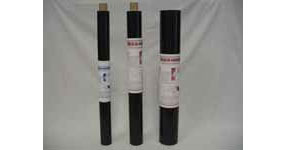 Mobile Flex is a special bottom closure material woven from black tapes of high-density polyethylene that is coated with a continuous layer of low-density polyethylene. Easy-to-use tape form, perfect for small jobs. Flex-Mend is a woven polyethylene fabric, solid-coated with a specially formulated, very aggressive adhesive. An easily removed paper release is laminated to the fabric. With ordinary scissors, any size or shape patch or strip can be cut to fit the damaged area. All size rolls are shipped in a poly sleeve, and 100' rolls are individually boxed. Application instructions are packed with each roll. 10 sq. 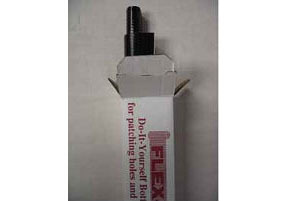 ft. (54" x 28") of Flex-Mend along with 20 sq. ft. (108" x 28") of woven polyethylene bottom board. This combination of materials permits the homeowner to repair small holes,tears and cuts by making patches of Flex-Mend, or to repair larger damaged areas where the original bottom board is missing using bottom- board replacement material. Then Flex-Mend can be cut into strips and applied as a tape to seal the uncoated bottom board patch in place. Application instructions are printed on the outside of each box. Strip of the original FLEX-MEND with a sewn in zipper, that runs the length of each strip and is centered in the material. Uniform poly film meeting code requirements of an equivalent 6 mil polyethylene sheet. Minimizes the total area needed for ventilation under home. According to code: Except in arid regions with dry soil conditions, a uniform 6-mil polyethylene sheet material or other acceptable vapor barrier material should be installed on the ground surface beneath the home to further reduce moisture. Where an acceptable ground vapor barrier is installed and one such ventilation opening is within 3 feet of each corner of the home, the total area of ventilation openings may be reduced to one sq. ft. for every 1,500 sq. ft. of home. Works well on bottom board, vinyl tops, metal or vinyl trim, styrofoam, foam rubber, glass, plastics and much more. Gives high solids, water-resistant bonds offering quick tack, non-wrinkling and flexibility. Web spray pattern. Bonds on contact. Precise spray control. Excellent balance of heat & cold resistance. Soft glue line. Aggresive tack - increases production speed. Excellent bond strength - Reduce reject rates. 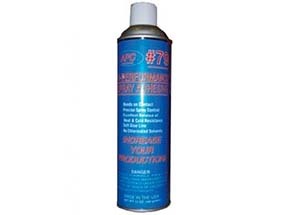 No Chlorinated Solvents - No ozone depleting chemicals. Non Dimpling - Soft Glue Line - Increases the quality of finished product.